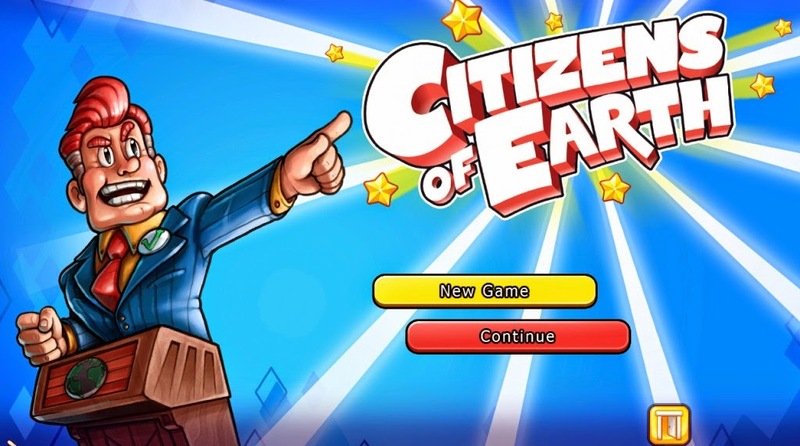 Citizens of Earth owned by Atlus inc. Images used for educational purposes only. - First up, after being awoken by mom: name your Vice President. Huzzah! For clarity’s sake, he’ll be referred to as Vice President, or VP, throughout this walkthrough. - Have a poke around the VP’s room. You’ll find $200 in his dresser, two Dirty Socks on the floor, and, if you check the bed, you’ll fin the option to sleep - and to dream. Dreaming will take you to a hazy, monochromatic version of the world, which, while nifty, is also currently useless to you. We’ll come back to this once your VP finds an expert on dream analysis. - Pop out into the hallway and speak to Brother, the VP’s bro. He’ll give you the quest Brother Recruitment. To complete the quest, go downstairs and check the present on the kitchen table. This will gain you a uTab… and if you speak to Brother again, he’ll join your party. Brother can be used to order items while you travel. You’ll want to speak to virtually everyone you meet, as you can recruit other folks in a similar fashion. 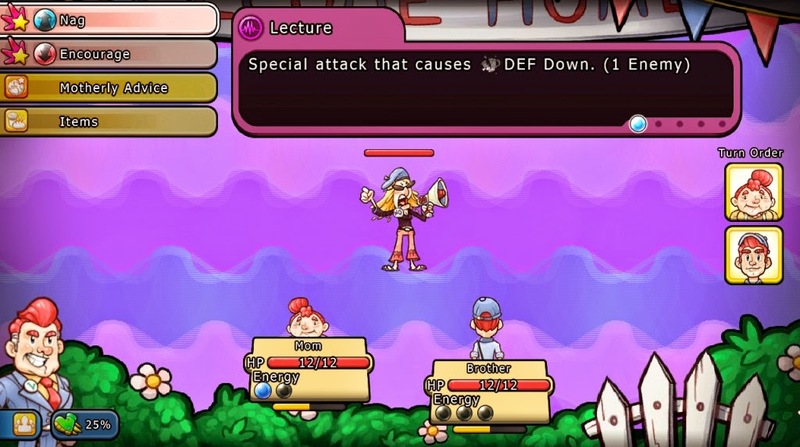 Combat in Citizens of Earth. Whomp that stupid Heckler good. 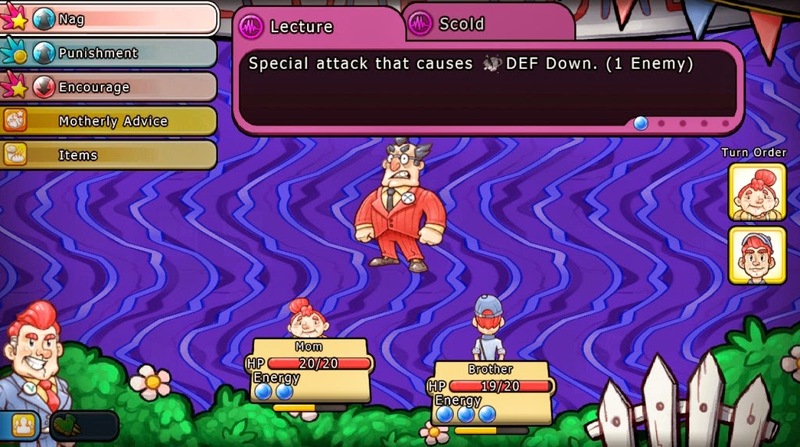 Combat in Citizens of Earth is turn-based. Each round you must give orders to the members of your party (at this point Mom and Brother) so they can take down your foes. Each citizen you recruit has their own set of moves - Mom deals with buffs and debuffs, while Brother likes to attack - so you’ll need to mix and match your teams to form strong combinations of moves. Each move your characters possess has an Energy cost, and they are divided into categories (Nag, Roughhouse, Pummel, and so forth). Stronger moves require more Energy, forcing you to hold back on turns if you want to use your most powerful moves. It’s often better to wait an extra turn by using a weaker move, then come back with an extra-strong move two or three turns later, than to keep using moderately powerful attacks. 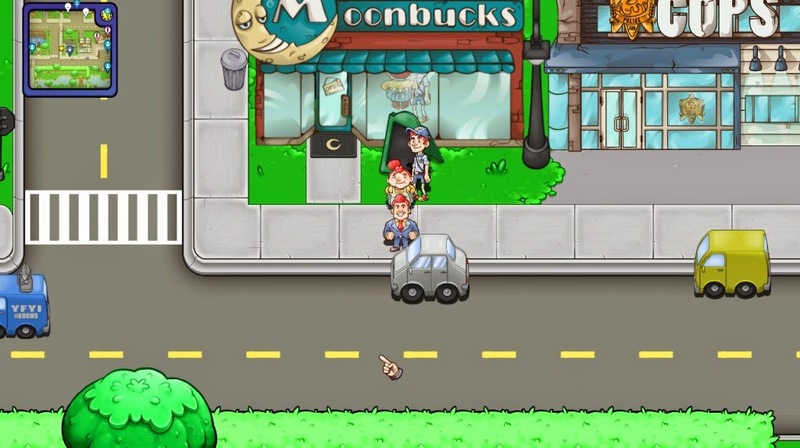 All this aside, Citizens of Earth is your standard RPG as far as combat goes. Take down your enemies by reducing their HP with attacks before they can do the same to you. Sound good? Most surely it does. Beating enemies will gain experience for your citizens, and when they gain enough experience they will level up. If you have the proper combinations of characters together in a party together when levelling - for example, Mom and Brother - they may provide one another with minor, additional stat boosts. For this reason it’s a good idea to keep complementary characters together when forming teams. One last thing: try to attack enemies from behind. Your VP can order his followers to fly out and attack enemies while on the map, and if you do so while at the foe’s backside you can ambush them and give yourself a small Energy advantage when the battle begins. Note that you must send your teammates rushing towards the enemy to receive an ambush - simply touching them from behind with your VP will not work. This works the other way, as well, and if you get caught from behind by an enemy you’ll lose Energy instead. The VP visits Moonbucks. Ahhh, dat refreshing Special Blend. - Back to the town. To the left of the house is a Photographer. Speak to her to gain the Photographer Recruitment quest, which will allow you to recruit her if completed. - There are a few enemies outside the VP’s House, including another Protester and a Heckler. You’ll find plenty more of them wandering Home Town to the northeast, if you want to grind out a level or two. - Next door to the east is a Moonbucks. Check the sign out front for a smidge of experience, then head inside. There are several people inside who are enamoured of Special Blend, a fantastic form of coffee that’s a bit too good to be true. Speak to the Conspiracy Guy and agree with him to gain the Conspiracy Guy Recruitment quest, then speak to the Barista and ask about Special Blend for the Barista Recruitment quest. You can also buy restorative items (coffee!) from the Barista. Check the sign in the rear of the Moonbucks for more experience. - Leave Moonbucks and a Bodybuilder will pop up. He’ll challenge the VP to some muscular madness, triggering the Bodybuilder Recruitment quest. Once he’s gone, pop into the Police Station to meet the Cop, who will give you the Cop Recruitment quest if you speak with her. You can also talk to her about Wanted Posters, which provide you with criminal challenges to take down. Check the posterboard and paper taped to the wall on either side of the Cop for experience before you leave. - Next to the Police Station is the Bakery. Check the sign out front for experience, then step into its fresh-smelling confines. Inside you’ll meet the Opposition Leader, who will update Your Unadoring Public once he leaves. You’ll also gain the Baker Recruitment quest. Chat with the Farmer to receive the Go Nuts For Donuts quest, and ask her about recruitment for the Farmer Recruitment quest. Check the sign and oven in the back of the Bakery for experience, and check the present on the eastern table for a Donut. - Head north from the Bakery. There are two houses to your left; pop into the first. Check the trophy near the entrance, the bookshelf, and the fridge for experience, then speak to the Superfan. She’ll give you the Superfan Recruitment quest if you ask her about joining up. She also has Citizen Cards that reveal the strengths and weaknesses of the citizens on your team. - There’s another house next to the Superfan’s. There’s little to see inside… save for a dresser in the back corner of the place, behind some boxes. It contains $500. Score. - The Opposition Leader is nearby, but don’t talk to him yet. Continue west to find a white house. Speak to the dude inside for the Handyman Recruitment quest, and check his bookshelves for experience. - One house left to go. You’ll find a chalkboard and several book cases inside that provide experience, and there are two more chalkboards upstairs that provide the same. Also up here is a dresser containing a Nootropic. On the ground floor is the Cat Lady, and she’ll give you the Cat Lady Recruitment quest if you speak to her. - That’s the end of Home Town as you can currently access it. Time to chat with that Opposition Leader… and, y’know, maybe take him down. The VP and company take on the Opposition Leader. As far as boss battles go, this first one is pretty easy. Aside from some meh physical attacks, the Opposition Leader’s greatest ability is calling in his Hecklers to join the battle. They shouldn’t pose a problem for your team. Have Mom whittle down his defence while Brother goes for your strongest physical attacks. The two working in conjunction will take him down pretty quickly, whether he brings in backup or not. You’ll get a Chess Ribbon for beating the Opposition Leader.